A young family is carving pumpkins and scooping out the inside. Cooking the inside of a pumpkin, or the guts, for use in other recipes lets you control what additives go into the cooked pumpkin. You can use it in pumpkin pie, bread, parfaits and soup. Use baking pumpkins rather than the larger pumpkins you see around the holidays, as the larger pumpkins are not as sweet and tend to have a grainy texture. 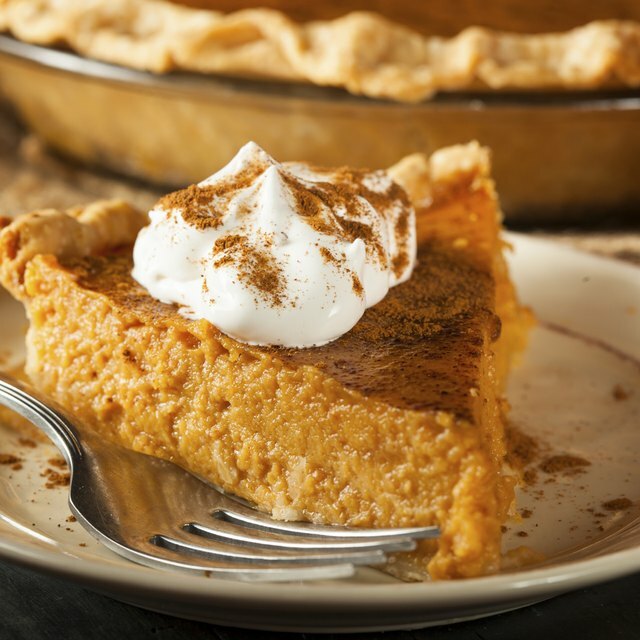 One cup of home-cooked pumpkin has about 75 calories. Cut a 6 to 7 lb. pumpkin in half horizontally with a sharp, serrated knife. Clean the seed and the strings from interior of the pumpkin using the side of a metal spoon. Remove only the seeds and strings, leaving as much meat — or guts — inside the pumpkin as possible. Clean the inside and outside of the pumpkin under running water. Place the pumpkin halves into a large baking pan with the open sides facing down. Place the pumpkin halves into an oven preheated to 375 degrees Fahrenheit. Bake the pumpkin for 1 1/2 to two hours, or until the interior of the pumpkin is tender enough to cut with a fork. Remove the pumpkin halves from the oven and allow them to cool until you can safely touch the pumpkin without burning your hands. Scrape the pumpkin guts from inside the pumpkin shell and transfer the guts, a small amount at a time, to a food processor and puree the pumpkin. Add the salt to the puree and blend once again. Can You Cook With a Halloween Pumpkin?